“As I traveled on, the air was literally filled with pigeons. The light of noon-day was obscured as by an eclipse, and the continued buzz of wings had a tendency to lull my senses. Before sunset I reached Louisville, Kentucky. The pigeons passed in undiminished number, and continued to do so for three days in succession. The people were all in arms. The banks of the Ohio were crowded with men and boys, incessantly shooting at the pilgrims, which flew lower as they passed over the river. Multitudes were thus destroyed. For a week or more, the population fed on no flesh other that of pigeons, and talked of nothing but pigeons.” – John James Audubon 1813. It is believed that before European colonization of North America the passenger pigeon population numbered more than 5 billion birds. 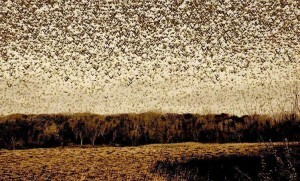 It was most likely the most abundant bird in the world. The passenger pigeon provided an anticipated bounty to Native Americans in eastern North America. Early settlers also routinely dispatched the birds in large numbers but by the middle of the nineteenth century their numbers were still in the billions. Sixty some odd years later their numbers equaled one. Then on September 1, 1914 Martha, a captive passenger pigeon at the Cincinnati Zoo, slipped from her perch and then there were none. 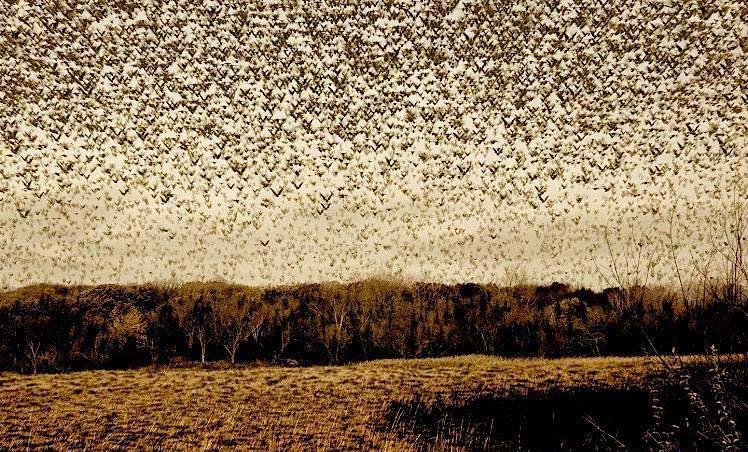 Yep billions (with a “b”) of wild passenger pigeons disappeared from the North American landscape in a scant six decades. And disappeared is actually misleading because there is no mystery associated with their extirpation. They were slaughtered for money. Technology was likely the final nail in the coffin of the passenger pigeon. Flocks of millions upon millions of birds did not go unnoticed and once railways and telegraph began to stretch across the country all it took was a short message stating a flock’s location and hunters (pigeoners) would hit the road getting there in time to decimate the flock. Sadly there was a scientific gap too. Simple numbers camouflaged the unique biology of the passenger pigeon. The idea was – there are billions of them take all you want. It was even an official mantra: When a bill was brought to the Ohio Legislature in 1857 seeking protection for the passenger pigeon the Senate filed a report stating, “the passenger pigeon needs no protection. Wonderfully prolific, having the vast forests of the North as its breeding grounds, traveling hundreds of miles in search of food, it is here today and elsewhere tomorrow, and no ordinary destruction can lessen them or be missed from the myriads that are yearly produced.” Fifty-seven years later the passenger pigeon was extinct. Passenger pigeons produced only one egg per pair per year. When pigeoners began taking all squabs (fledgling passenger pigeons) at nesting sites it guaranteed there would be few adults to replenish the population. Without intervention – reproductive rates could never keep up with the annual slaughter of squabs – and there was no intervention. Have we learned our lesson? About the only place this same kind of scenario plays out is in the depths and breadths of our oceans, where the commercial harvest of bluefin tuna has reduced the overall population by 96 percent – it seems from the skies to the seas profit reigns.